i’m loving all the winter citruses lately. pete and i just visited my grandpa in palm springs, where the lemon and grapefruit trees were exploding with huge amounts of citrus. they smell so amazing right off the tree...it’s the best. we love waking up there and having the most fresh and juicy grapefruit for breakfast. i always smuggle back several lemons and grapefruits in my backpack and giggle as i watch the blobs pass by on the x-ray security machine. 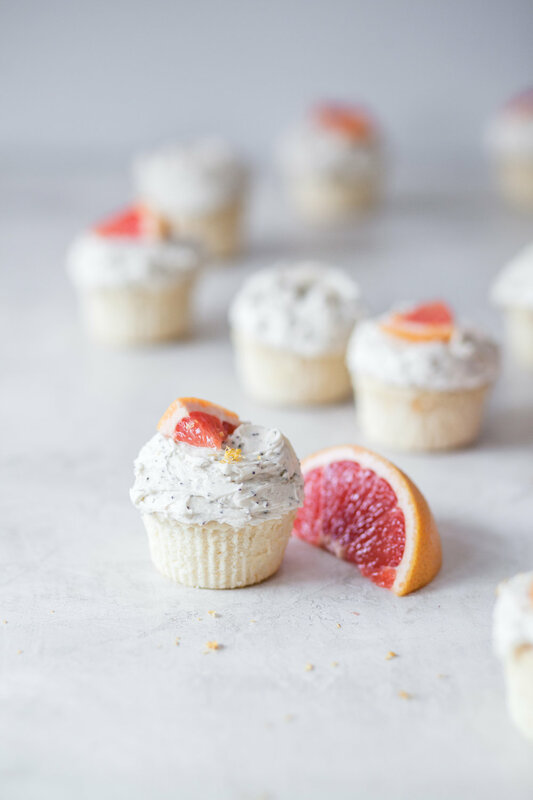 these cuppycakes are inspired by two of my favorite go-to food bloggers in the land, how sweet eats and a cozy kitchen. the mojito cupcakes are actually from jessica of how sweet eats’ cookbook, the pretty dish, but adrianna from a cozy kitchen blogged the recipe for jessica’s mojito cupcakes here. after doing some funky riffing and experimenting with both the cake and frosting portion of this recipe - i decided i need to forever leave it to these two pros and stick to the scripts. in an attempt to be all timely for valentine’s day, i experimented using juice from raspberries to make the cupcakes pink. it sort of worked, but they turned out to be even more dense than they already are, and more lavender purple than pink. so i scrapped that idea for this valentine’s purpose and left them white. i can stick that naturally-dyed raspberry juice idea in my back pocket for another day when i need a light purple cupcake - the flavor was actually surprisingly good and juicy, but heavy. and then, much like my attempt at the end of last year to make a pumpkin cream cheese frosting, i found myself in curdled grainy frosting hell and had to throw my first attempt out - which makes me SO sad. i thought using the whisk attachment on my kitchenaid would be smart in really whisking up the frosting to make it extra fluffy….. no. it’s not really smart. it was dumb, and a waste of food and i shall never make that mistake again. the best and most fluffy frosting i’ve ever had was from a cozy kitchen, so i went exactly by her methods for my 2nd attempt at this frosting. i will forever leave all frosting wisdom up to her. use the paddle attachment, people. paddle. no whisky whisk! also, sifting the powdered sugar is a very key component. sift it, people! and it worked! 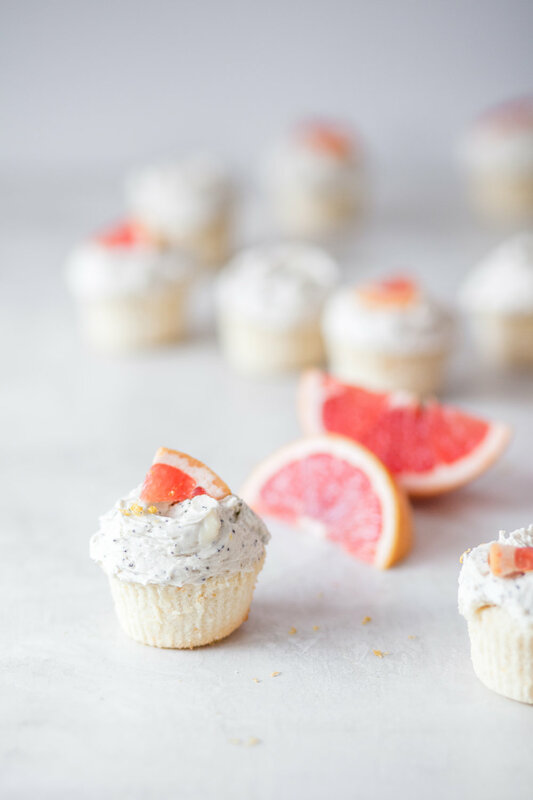 fluffy and thick buttercream, with just enough fresh grapefruit juice and zest to give it flavor, but not curdle the whole damn thing and make you want to cry. these are super refreshing, and quite indulgent! they are made with cake flour which makes the cupcakes pretty dense and rich, like an angel food cake. and then there’s sugary buttercream on top…which explains itself in the indulgence department. peter and i both think they turned out great. i love poppy seeds in things for that teeny tiny crunch factor. i wanted to see how it would work in the frosting instead of the cake part, and i quite like it up there! 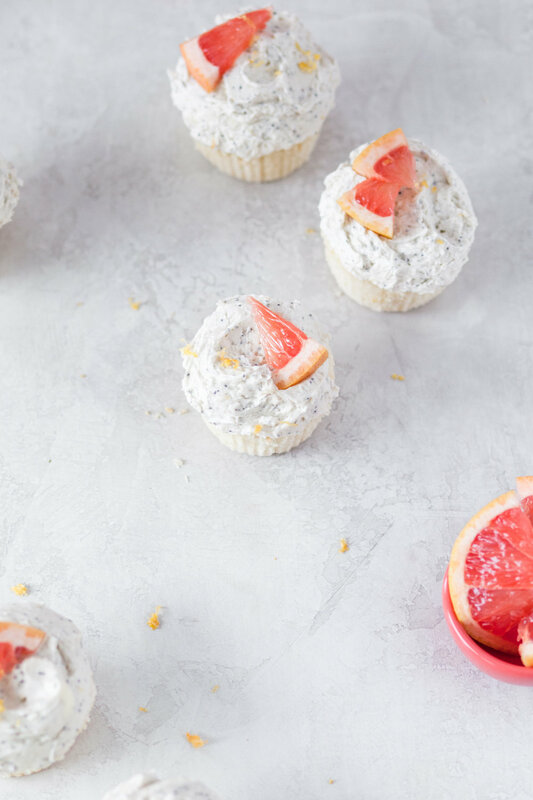 if you don’t like grapefruit, but like the idea of a fresh citrus & vanilla cupcake, you could totally make these with lemon, orange (blood orange?!? ), or lime - just don’t overdo it with too much juice in the cake or frosting, or you’ll be sawwwwryy (sogging, ew! curdling, ew!). i dunno, i’ve always LOVED grapefruit. just plain, without sugar. 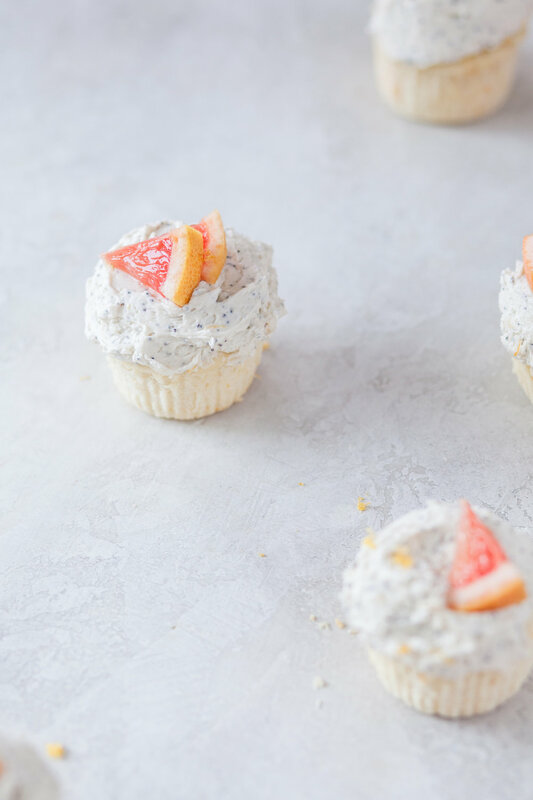 but if you’re someone who only takes their grapefruit with sugar, then these cupcakes are for you! To make the cupcakes, preheat the oven to 350 degrees F and line a muffin tin with 12 cupcake liners. Combine the cake flour, baking powder, and sea salt in a small bowl and set aside. In a stand mixer or with an electric mixer, beat the butter and white sugar until fluffy, about 3 minutes. Add the whole egg and egg white, beating well after each addition. Add the oil, vanilla, grapefruit zest and grapefruit juice and beat well for 2 minutes. With the mixer on slow, pour in the milk and mix to combine. Finally, slowly add the bowl of other dry ingredients and mix on medium speed until well combined. Fill the prepared cupcake liners about 2/3 full. Place the muffin pan on top of a baking sheet and bake in the oven for 17-20 minutes, until set in the center of the cupcakes. Let the cupcakes cool completely before frosting. To make the frosting, in a stand mixer using the paddle attachment or electric hand mixer with regular flat whisk attachments (not the thin wire whisk attachments), cream the softened butter. Slowly add the sifted powdered sugar and beat at medium speed between additions until the combination is fluffy. Add the vanilla, grapefruit zest, and grapefruit juice (no more than 2 TB of grapefruit juice or frosting will begin to curdle or get grainy!) and mix well. Add the 2 TB of heavy cream and beat on medium/high speed for at least 3-5 minutes, until the frosting is super light and fluffy. Lastly, add the poppy seeds and mix to combine. Use a cookie scoop or spoon to plop even scoops of frosting on top of the cooled cupcakes. Use an offset spatula or butter knife to spread the frosting. Garnish with thin sections of fresh grapefruit and extra grapefruit zest, if desired. Store in an airtight container at room temperature. Best enjoyed within 2 days!